While a number of people consider Pitch Johnson a pioneer, he doesn’t see it that way. 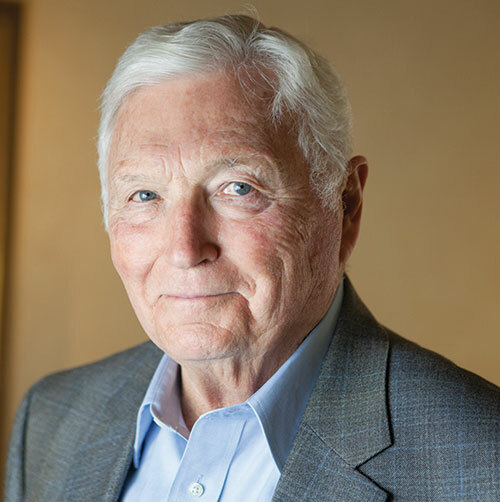 When he began his venture career, he says, he was “just trying to feed the kids and form some capital.” The man who helped launch some 250 businesses, including Amgen and Tandem Computers, takes a modest view of the early days in what—thanks to him and his colleagues—became Silicon Valley. Some of those invitations grew into serious businesses. Draper and Johnson invested in entrepreneurial opportunities, and then stuck around to advise the companies in their early phases. After three years, the pair sold their portfolio to Sutter Hill Ventures, and Johnson looked for a company to buy. Instead, he ended up back in the venture business, founding Asset Management Company in 1967. Over the ensuing decades, Johnson has earned a reputation not just as a smart investor but also as an insightful manager, a man of high ethical standards, and a team player. He provides more than money—quite often, his advice and counsel have been the key elements that helped entrepreneurs transform a good idea into a great business. The awards and accolades he has received—a park at Amgen headquarters is named after him, for instance—attest to his many contributions to the world of business, as do his outside activities, including presenting papers on entrepreneurship, venture capital, and democracy throughout the world and developing and teaching a venture capital course at Stanford Business School. Johnson’s father, also called Pitch, was a track coach who participated in the 1924 Olympic Games as a high hurdler and passed a love of running down to his namesake. The family moved to Palo Alto when Pitch was 12, and he ran on the track team at Palo Alto High School, which earned him an athletic scholarship at Stanford. “I was never as good a runner as my dad, but I learned a lot from him,” says Johnson, 84, who moves around very well considering he recently had both knees replaced. The teachings were not just about running the quarter-mile, but also about sportsmanship. “My dad taught me to shake hands with my opponents after the race, win or lose,” says Johnson. 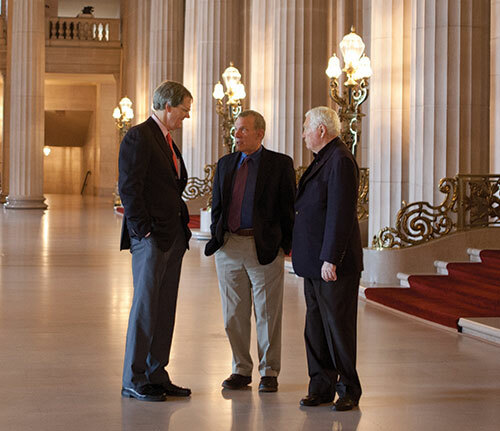 Johnson meets with San Francisco opera leaders. That attitude has served him well throughout his career in business as well as in his philanthropic endeavors. When the renowned San Francisco Opera fell on hard times after the dot-com meltdown in 2001, for example, Johnson—then chairman of the board—gave an inspiring pep talk. “We will not let this organization fail,” he told the directors and the staff, encouraging them not to give up on what looked like a dire situation. Then he tapped new donors and increased his own already substantial support. In addition to the Opera, through a family foundation, Johnson and his wife, Cathie, support a variety of educational and cultural institutions. An HBS professorship they funded is named after Cathie’s father, and they have endowed chairs at Stanford and supported the track programs at Stanford and at Drake University, where Johnson’s father began his coaching career in 1928. Closer to home, the foundation supports several smaller nonprofits that help local youth. “This town nurtured me,” says Johnson, whose four children were raised in the Palo Alto house where he and Cathie have lived since 1967. “Helping our community is important to us.” Johnson was an elected trustee of the Foothill-De Anza Community College District for 12 years. It’s a rare person who can talk about sports, opera, science, business, airplanes (Johnson is a private pilot), and Eastern Europe with knowledge and enthusiasm, but Pitch Johnson goes from one topic to the other with ease. With a warm smile, he has an easy manner that makes people from all walks of life feel comfortable. While he may scoff at the term “pioneer,” there is no denying that his combination of curiosity, humor, intelligence, and compassion has had a deep impact on Silicon Valley—and beyond.